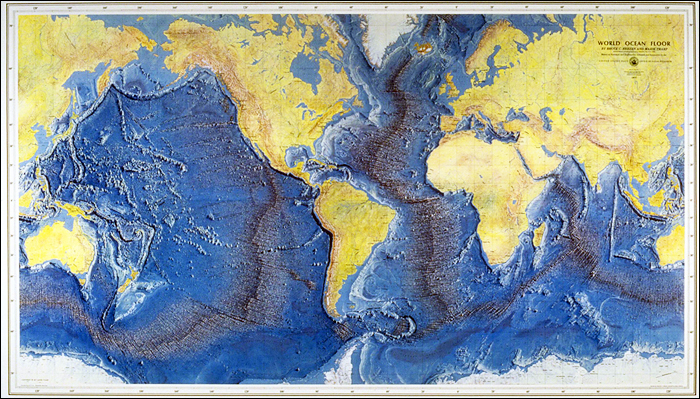 From "World Ocean Floor Panorama", Authors Marie Tharp and Bruce C. Heezen, 1977. Copyright by Marie Tharp 1977/2003. Reproduced by permission of Marie Tharp Maps, LLC , 8 Edward Street, Sparkill, New York 10976. Find the midocean ridges on this map. What is the name of the undersea mountain range that is the midocean ridge in the Atlantic? What is the name of the undersea mountain range that is the midocean ridge in the Pacific? Are both midocean ridges in the middles of their oceans? When do you think people first discoverd these undersea mountain ranges? Who are Marie Tharp and Bruce Heezen? © 2007-2008 Earthguide at Scripps Institution of Oceanography.